Third post of this type. 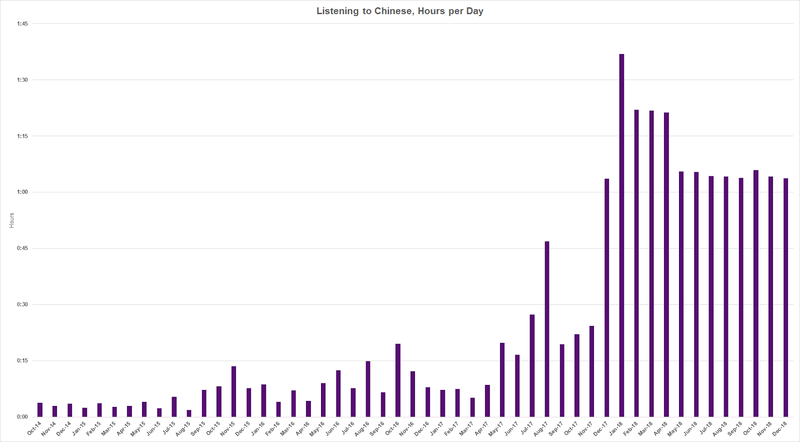 Last year I spent 435 hours on Mandarin listening comprehension. 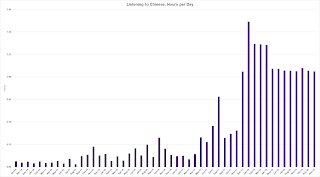 I started doing at least one hour a day of ChinesePod on 12/07/17. That streak is still alive. I missed several days, but every time I did 2 hours the next day to compensate for that. I've now spent a total of 731 hours on Mandarin listening comprehension. I'm now on my 102nd Upper Intermediate ChinesePod lesson. The funniest part is at 2:25, where the guy says that the machine is writing the name Jacquet Droz in English cursive. ying1 wen2 zhe4 ge cao3 xie3 de ming2 cheng1. It's a French personal name. But I guess all Latin-character writing is "English" to some Chinese people. That thing costs $367,500. I didn't look for a Chinese video of it. I just searched for the Jacquet Droz signature machine, and this was one of the first things that came up. The rise of Japan gave the luxury industry a boost. The ongoing rise of China will make Switzerland even richer. 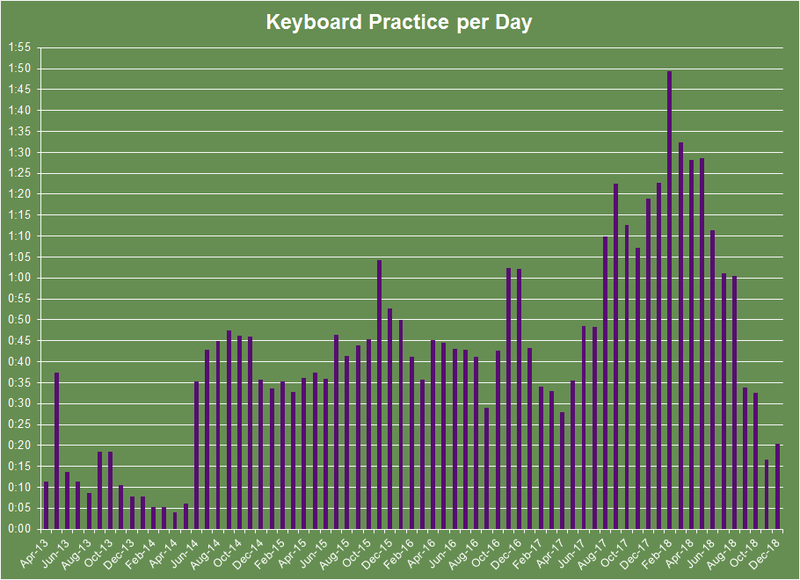 Back to the year in nerdiness: In September I lost a lot of my enthusiasm for piano practice. That's normal. Nerdy enthusiasms come and go. 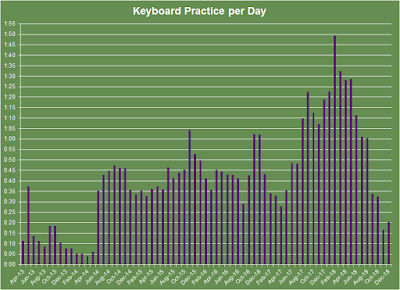 I'll probably go back to practicing a lot at some time in the future. Outside of work I don't force myself to do anything. Which is why I can't predict which of my hobbies will get most of my time in 2019. It's all meant to be fun. The Cambridge History of Ancient China, 1999, edited by Michael Loewe and Edward L. Shaughnessy. Glossy's rating: 6.5 out of 10. This is a history of China from the earliest times until the establishment of the first empire in 221 BC. First, a few words about sinology itself. The Western kind begins in the 16th century with Italians, Spaniards and Portuguese. The French were prominent in this field later, especially in the 19th century. It’s amusing to see such a small and arcane specialty reflect titanic geopolitical shifts. The largest Chinese-Western language dictionary today is Chinese-French, a legacy of earlier times. Since Japan was one of WWII’s losers, you don’t often read positive things about Japanese endeavors during that period. But this book says that Japanese archeologists did a lot of work in China in the first half of the 20th century, especially in the 1940s. Westerners did too. The Chinese only joined them after the Communist takeover. The authors complain that Communists pushed the study of Chinese history in the Chinese-nationalist direction starting in 1949. This supports the idea that Mao was a Stalin-like nationalist, not a Lenin-like leftist. Agriculture began in China, both in the north and the south, at roughly the same time as in the Middle East, soon after the ice retreated. The main crops were different though - wheat in the Middle East, millet in North China, rice in South China. If the birth of agriculture in those places was prompted by the end of the Ice Age, why didn't farming start in the tropics, which were never under the ice? Perhaps Ice Age conditions selected for intelligence, which could be used in novel ways once the environment changed. Today Arctic hunter gatherers have a much higher mean IQ than tropical ones. It’s a little misleading to say that the Chinese ethnicity, language, culture and state originated in northern China before spreading south. Actually, they originated in a pretty small part of northern China, namely the middle of the Yellow River valley. Why? Most early civilizations developed on the banks of huge rivers between the 30th and 34th latitudes. Egypt, Sumer, China, the Indus Valley civilization. Apparently primitive agriculture was most productive in that kind of environment. This book mentions that the thick layers of silt deposited by the Yellow River over the centuries have concealed many Neolithic and Bronze Age sites from archeologists. That’s also true in Egypt. And this silt was beneficial to farming. It’s not surprising that a well-defined natural and economic region would produce an ethnicity and a culture of its own. During the first millennium BC the people of the middle Yellow River valley called themselves Hua Xia. Both elements of this word could be used individually. Both survived into modern Chinese. Hua can now be seen in the official names of the People’s Republic of China and of Taiwan. The earliest evidence of metal-making in China is from 2000 BC, later than in Europe and the Middle East. Some say that the Chinese developed the necessary techniques by themselves, others think that they borrowed them. This book does not take a side. Traditional Chinese histories call this period the Xia dynasty. Chinese characters hadn’t been invented then yet, so we don’t know much about it. This was the Shang dynasty. The expansion is conjectured from the uniformity of bronze vessel styles in tombs over a wide area. This conquest spread metal working to the Yangtze River valley in what is now central China. It seems that a feudal breakup occurred soon after the Shang expansion. It’s not clear how much the later Shang controlled other polities in north China, partly because those polities did not leave any records of their own. The book suggests that the Chinese borrowed the chariot from peoples further west, perhaps the Tocharians. It appeared at the Shang capital fully formed around 1200 BC. There is no evidence of any wheeled vehicles in China prior to that point. Wagons are attested in the Western part of Eurasia from the 4th millennium BC. It’s uncertain how chariots were used in battle. They could have been “showy vehicles for commanders”. Archers could have fought from them. Iron, which makes better weapons than bronze because it is harder, reached China in the 6th century BC, long after it appeared in Europe and Middle East. Iron was also more useful in farming than bronze. You have to realize here that none of the tombs of the Shang or Western Zhou kings have been excavated intact. Most were never located. All of the known ones were robbed in antiquity. The stuff currently in museums, including more than 10,000 Zhou-period bronzes, was found in tombs of less important people. It represents a small percentage of what must have been buried in antiquity. When you read about things like that it’s natural to wonder if anybody considered this a waste at the time. The answer is “yes”. There are records from the middle of the 1st millennium BC of people complaining about rulers squandering resources on their tombs. The number of vessels of specific kinds that a person was buried with was determined by his rank in the feudal system. This was regulated by law. Chinese bronzes were usually decorated with pictures of animals, in contrast to other cultures. Another peculiarity is that in ancient China walls were usually made of rammed earth, not brick or stone. In the Shang dynasty prisoners of war were slaughtered during funerals of kings and buried in their tombs. That practice stopped by the 11th century BC. Servants, concubines, chariot drivers and other retainers continued to be killed and buried with their lords for many centuries afterwards. Some of these people were buried with their own attendants, creating a hierarchy of human sacrifice. Horses were interred with their owners too. One tomb described here had 600 horse sacrifices. A jade dragon of the Hongshan period (4700 BC to 2900 BC) was found in a tomb of about 800 BC. This was not the only such find. It’s interesting to think about possible explanations for it. The coolest one is that these were family heirlooms of the elite. But they could have also been products of ancient grave robbing or archeology. The ancient Assyrians did perform archeological digs at about this time. At the end of the 19th century, as the spirit of Western scientific skepticism spread in China, it became popular for Chinese scholars to dismiss traditional accounts of their ancient history as myth. Also, when Western power was at its strongest everyone wanted to emulate Europe. Looking for sources of pride in non-Western history seemed backward. Around 1898 Chinese antiquarians became interested in “dragon bones”. These were sometimes unearthed by farmers, who ground them up and used them as medicine. People noticed that some of these objects, which turned out to be ox and turtle bones, had inscriptions in an unusual style. The source of these bones was eventually found by archeologists. More than 200,000 of them have been excavated to date. The names written on many of the bones belonged to the kings of the late Shang dynasty, which were mentioned by traditional Chinese historians like Sima Qian from the 1st century BC. It turned out that many of these stories weren’t myths after all. The order of the kings and many other details check out. “Inscriptions first appear on bronzes at about the same time they appear on oracle bones, a coincidence which favors the possibility that this was the first appearance of writing itself”. Other parts of the book throw some doubt on this. All Shang dynasty inscriptions that have been unearthed are from one site, Anyang, the capital of the dynasty. And they appear exactly when the capital was founded. Also, the writing system of the earliest oracle bones is pretty well developed. Could writing have been brought to Anyang from the previous, much less well-excavated capital? Bamboo was likely one of those materials. The oracle bone texts contain a character in the shape of bound bamboo planks, which is identified with the later word for documents. No bamboo records from the Shang dynasty have survived. Pottery shards from around 1600 BC with brief inscriptions, up to 12 characters in length, have been discovered at an archeological site in central China called Wucheng. But these inscriptions are too few and too short for decipherment. It’s interesting that for the first two thousand years after the invention of writing in East Asia, it only existed there in one language, Chinese. When other peoples learned to write, it was after they were assimilated into Chinese culture. Eventually this stopped working. Vietnam was never fully sinicized. Korea and Japan retained their languages. The nomads of the steppe were incompatible with sedentary civilization. But the pattern of assimilation worked for an awfully long time. This is why most of East Asia is Chinese today. From the start, things worked very differently in the Caucasoid half of Eurasia. Writing was invented simultaneously by two peoples who spoke completely unrelated languages - Sumerian and Egyptian. It was quickly picked up by Akkadians, whose language was very distantly related to Egyptian. Then Elamites, Hurrians, Hittites, Minoans, Mycenaeans and many others picked up writing from their neighbors. Dozens of languages belonging to at least half a dozen families were written in antiquity in West Eurasia. Perhaps the difference in conformity levels between the Mongoloid and the Caucasoid worlds was already present then. At the earliest stage of writing people drew pictures to represent objects and ideas. So every time that writing was invented from scratch, it involved thousands of complicated signs. But by 2000 BC Levantines simplified things by inventing an alphabet. Why didn’t this happen in ancient China? Just a guess: the Caucasoid world had many literate cultures. This provided space for experimentation. Eventually one of these cultures came up with the alphabet breakthrough. Diversity isn’t always a weakness. The Chinese might have come close though. The book mentions the hypothesis that “the set of twenty-two signs known as the “Heavenly Stems and Earthly Branches”...”represents an exhaustive and non-repeating inventory of the consonants in the language.” These symbols are already present in the earliest inscriptions, from 1200 BC. But this did not lead to the development of alphabetic writing. The Shang dynasty was replaced by the Zhou around 1045 BC. Shang oracle bone inscriptions first mention the Zhou as living in the Fen River valley. Later they relocated to the Wei River, on the western frontier of Chinese civilization. 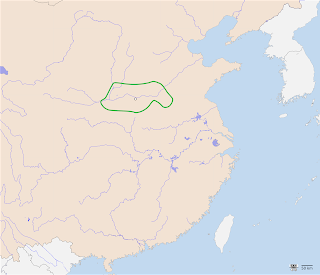 At the time of the Zhou conquest the material culture of that area was much simpler than that of the middle Yellow River region (the Chinese heartland) or of the Yangtze region (the south). However, the Zhou conquest was not a barbarian invasion in the usual sense. The Zhou adopted the writing system developed by the Shang instead of destroying it. In fact, inscriptions from the Zhou period have survived all over civilized China, not just in the capital, as was the case with the Shang. Originally the Zhou used relatively simple bronze vessels. After the conquest they adopted the more sophisticated Shang style. The Zhou state was feudal. The territory that it conquered from the Shang and others was split into fiefs which were given to members of the Zhou royal family, allies and local potentates. The remnants of the Shang dynasty were given an area as well. The holders of these fiefs tended to subdivide them among their descendants. Eventually there were more than 150 states. The cohesion of the Zhou elite weakened as the genealogical relationships between the rulers became more distant. The amount of deference accorded to the Zhou kings, the dynasty’s main line, decreased with time. “In the Chinese tradition, the Western Zhou (1045-771 BC)”...”was always regarded as China’s finest and most noble age.” This must have been partly because of the greater unity of China in this period than in the immediately preceding and following ones. I’m guessing that feudalism, with its attractive martial values, had something to do with it as well. The Chinese culture and economy became much more complex in the Spring and Autumn (771-476 BC) and Warring States (476 -221 BC) periods, yet those were still considered times of decline. In 977 BC the Zhou suffered defeat while campaigning in the south. The king was killed, along with a large portion of the army. Weakened, the dynasty survived. 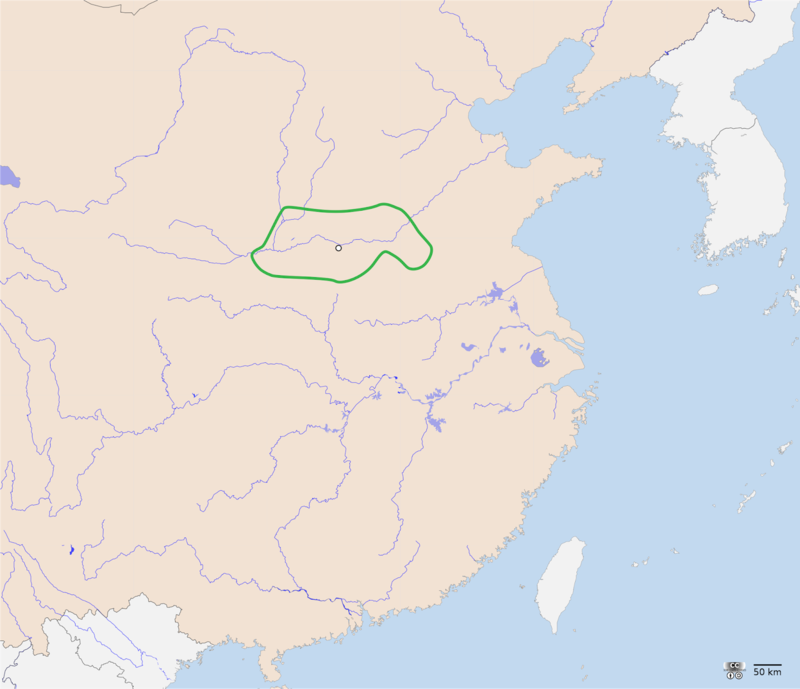 In 771 BC the Zhou court was driven from its Wei River homeland by a barbarian invasion. The king was again killed, but one of his sons set up court in a new location. This was the beginning of the Eastern Zhou dynasty. The leaders of the southern states, which were in the process of being sinicized at this time, were not descended from the Zhou kings who conquered the Shang around 1045 BC. Yet they fully participated in Chinese feudal politics. Occasionally conferences were held where rulers tried to work out common approaches to pressing problems. In 546 BC leading states agreed to limit the number of their war chariots. There was a similar agreement in 579 BC. I’m not aware of any pre-modern instances of mutual arms control in Europe or the Middle East, so I’m chalking this up as supporting evidence for the stereotype of East Asians being more concerned with social harmony than Caucasoids. Feudal lords lived in walled settlements which the book hesitates to call cities. They and their troops were called “the people of the state”, as opposed to the surrounding agricultural population, “the people of the field”. In fact, in the feudal period the term state mostly referred to state capitals. It’s interesting that in both the Chinese and European feudal eras historical writing often took the form of annals. All of the major courts of the Warring States period maintained them. Only the annals of Qin survived though, because that state ended up conquering all others. There are stories of ancient Chinese chroniclers being executed for including criticism of their rulers in annals. Chinese chronology is continuously sound from 842 BC, though some events as far back as Wu Ding’s reign (around 1200 BC) can be dated to within a few years because of their approximate correspondence with lunar eclipse records. I think about 99.9% of pagan Greco-Roman literature was lost during the Dark Ages. China has had more cultural continuity than that, but its losses were also substantial. The complexity of economic and political relations increased continuously during the 1st millennium BC. Iron implements probably made agriculture more efficient. The use of irrigation and fertilizer increased. New areas were brought under the plow. The population density went up. The cities grew. Inside them specialization, division of labor led to serious cultural advances. In the 7th and 6th centuries BC feudalism began to give way to territorial states administered by paid professionals. Armies, staffed by nobility at first, began to recruit the peasantry. This made them much larger. Never-ending low-grade warfare morphed into periodic large-scale wars. States swallowed each other up. After a while only a handful of them remained. Perhaps this is why no descriptions of battles have survived from the pre-imperial (before 221 BC) period in China. There was a tradition of rulers committing suicide after their armies were beaten and all was lost. More than 3,000 years after the last king of Shang killed himself East Asian politicians and businessmen are still more likely than Caucasoid ones to respond that way to failure and disgrace. The population of the states was registered to improve taxation and military mobilization. By imperial times people’s place of origin, age, height and social status were usually recorded. Maps were attached to population registers. In Europe cavalry was most important during the feudal period. China experienced feudalism much earlier, when chariots were still dominant. In fact, the introduction of cavalry to the country in the 4th century BC coincided with the death of the feudal order in China. Mounting a horse can seem like a simpler task than building a chariot. You can’t use chariots in many types of terrain where horses are comfortable by themselves: fields of grain, rocky ground, swamps. So why did chariots precede horse riding? I’ve seen suggestions that it took time to breed horses big and strong enough to be mounted. As the feudal order retreated, trade became more important. This was resented by some. The book records a decree from the state of Qin that classified merchants as “inferior people”. It went on to forbid them to wear silk and ride horses. Coins replaced barter and cowrie shells. Initially they weren’t round, but in the shape of miniature spades and knives. When round coins appeared, they had holes in the middle, so that they could be strung together. While Middle Eastern and European coins were stamped, Chinese ones were cast. These serious differences suggest separate inventions. Governments began to use currency before merchants. At the time of Confucius the taxes paid by the peasants were “as high as” 20% of the crop. Unlike central states, the ones located at the periphery of the Zhou “league” could expand into tribal, barbarian areas. This made them larger and more powerful. Eventually one of them, Qin, conquered all of China. It came from the same hinterland as the Zhou 800 hundreds years earlier - the Wei River valley. The word for China in most of the world’s languages, including English, apparently comes from “Qin”. In modern Mandarin it’s pronounced something like “Chin”. It was the westernmost Chinese state for most of the 1st millennium BC, and therefore the most accessible one to Persians and to peoples west of them. The Shang and Zhou rulers held the title of “wang”, which is normally translated into English as king. The book suggests that this term could be related to a word meaning “emaciated”. Kingship may have grown out of shamanism. In cultures where that institution has survived to our days, shamans are thought to acquire their powers after overcoming serious illness, during which they come in contact with the underworld. As the main Zhou line declined, the royal title became less important. Other rulers began to claim it. The first of those was the leader of Chu, originally a non-Chinese state in the south. Its elite felt less bound by Chinese cultural conventions than the rulers of central states. Title inflation created a need for grander terminology. In 288 BC the rulers of Qin and Qi declared themselves to be the eastern and western “di”. Up to that point that word only described Gods. When Qin united China in 221 BC, its ruler called himself the “huang di”. The huang were God-like rulers from Chinese mythology. The huang di title was retained by subsequent dynasties. It’s the one that’s normally translated as “emperor” into English. As feudalism declined, the elite became less martial. Consequently, the art that they commissioned became less severe, more playful and sensual. Personal ornaments gained in importance at the expense of ritual vessels. The same trends were observed when Europe moved away from feudalism centuries later. Intellectual activity blossomed. It’s amazing that Chinese and Greek philosophies developed at the same time. Confucius is considered the first Chinese philosopher. He died in 479 BC. His ideas were relatively simple, but things became more complex in the following two centuries, like in Greece. These two philosophical traditions dealt with many of the same issues. Pacifism, universalism, anti-universalism (caring about one’s family first), altruism vs. selfishness, withdrawal from the world, criticism of such withdrawal, the theory of the political state, complicated arguments about the ways in which the mind interacts with the senses, questioning of assumptions about what one knows and how one knows it, classification of different types of arguments. Predictably, there were people making fun of the sophistry, BSiness of much of this stuff. Confucius was a government official, but not an important one. None of the great philosophers were prominent in politics. Most of them came from the class of gentlemen (shi), descendants of the now-obsolete martial aristocracy. Confucius traced his line from the Shang kings, who are documented from 1200 BC, but likely ruled from roughly 1600 BC. Many modern Chinese claim to descend from Confucius. No serious claims of descent from antiquity are made in modern Europe. The longest documented genealogies there only go back to the 6th century AD. Like the Greeks, the Chinese wrote a lot of their philosophy in the form of dialogues. They were also interested in paradoxes and infinities. “A wheel does not touch the ground. [Possibly because a tangent to a circle is a point, without dimension]”. The book says that the Chinese of this time had the data that could have enabled them to discover the precession of the equinoxes. Instead this information was interpreted in an astrological way. In the remaining parts of the conquest sequence water conquers fire, fire conquers metal, and soil conquers water, which is an optimistic vision for a culture that was born on the frequently overflowing Yellow River. Around the 3rd century BC Chinese medicine moved from blaming diseases on demons which had to be exorcised to blaming them on imbalances and blockages of vapors. Chinese philosophy was deeply concerned with morals, society and politics. The Golden Rule. Another philosopher is quoted here as saying that “suffering insult is no disgrace”, which reminds one of the Christian advice to “turn the other cheek”. Xunzi defended “the principle that the ideal king will take care of the disadvantaged - the blind, deaf, crippled, maimed: “The government should gather them together, look after them, give them whatever work they are able to do,... provide them with food and clothing.” Environmental protection will be a concern of the sage-king: “When plants and trees are flowering or putting forth new growth, no axes may be taken into the hills and forests, for they will destroy life and injure the growing things.” The guiding principle is always: “The ruler is the boat, and the common people are the water. It is the water that bears the boat, and the water that capsizes it”. At the other end of the “would that sound normal now?” spectrum, under that same Shang Yang, the teachers of the heir apparent were punished for the crimes committed by their pupil. “...if one member of a squad of five fled in battle, the other four members would also be punished, unless they captured their fleeing comrade or were able to offer the head of an enemy to redeem their guilt. In addition, if any squad of five killed no enemy, its chief was liable for execution”. Group responsibility is a very East Asian concept. The Chinese states were surrounded on all sides by barbarian tribes. So naturally, they called themselves “central states”, Zhong Guo. This is now the most common Chinese name for China. It’s sometimes translated into English as the Middle Kingdom. There ARE ways of indicating the plural in Chinese, but they’re more like the ones in spoken French than in English. If you take a Chinese word out of context, it’s usually not going to have grammatical number. So “Central States” and “Middle Kingdom” are in fact the same term. The Hua Xia (ethnic Chinese) called the region to the south of them, in what is now central China, Yue (the beyond). At least some of its inhabitants spoke Austroasiatic languages like Vietnamese. In fact, the modern word Vietnam comes from the Chinese phrase “yue nan” (the southern beyond). The book says that the Yi barbarians, who lived at the same latitude as the Hua Xia, but to the east of them, on the coast, were probably also Austroasiatic. Chinese-language inscriptions from the state of Chu, in what is now central China, show a substrate influence from a language related to Tai. The Rong barbarians who lived to the west of the Chinese seem to have spoken Tibeto-Burman languages. This region is now very much a part of core China, quite far from Tibet or Burma. There is a widespread image of China being bordered on the north by fierce nomads. This wasn’t always true. Until well into the first millennium BC the area north of the Yellow River valley was agricultural. It wasn’t as densely populated as the Central States, aka the Middle Kingdom. This was at least partly because it was more arid. Animal breeding was more important there than in the ethnic-Chinese region. But northerners did sow crops and did live in permanent settlements. True nomadism only arose around 800 BC, in the heart of the steppe. It reached China’s borders centuries later. The book says that nomads were likely descended from farmers, although it allows the possibility that some hunter-gatherers could have become nomads by borrowing domesticated animals from agriculturalists. What pushed people towards the nomadic lifestyle? The authors can only offer guesses: overpopulation, drought, increased experience with animal husbandry, large migrations due to conflict. A particular type of art was common to nomadic peoples throughout the steppes. It’s called the Animal Style. The book says that Assyrian and Achaemenid art is “assumed to have played a role” in its evolution. When the state of Qin unified China in 221 BC, it tried to redirect the country’s energies from internecine wars to the conquest and settlement of the north. The need to resist the Chinese caused the nomads of the eastern steppe to unify in turn under the leadership of the Xiongnu. The Xiongnu were likely ancestral to the Huns, though perhaps not linguistically. The shockingly bloody collisions between the settled and nomadic worlds in East Asia are, however, a matter for other volumes in this series.